This blood orange, rosemary, vodka cocktail delivers flavor notes you'll love. Bring the water to a boil. Add sugar and fully dissolve. Remove from heat. Stir in blood orange puree. Pour into a jar with lid. Add rosemary spring and seal once it has cooled. I personally would let it sit at least 24 hours before use. Store in the refrigerator. In a shaker, combine all ingredients except the Club Soda. Shake with ice, strain into an Old Fashioned glass filled with new ice. 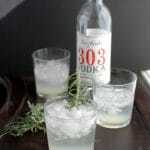 Top with soda and garnish with rosemary sprig.